You can choose how you’d like this pastry cream. Instead of xylitol you can use sugar. You can use full-fat or semi-fat milk, or any kind of non-dairy milk, and instead of cornflour some people use plain/all purpose flour. Below is my ‘healthy’ version. These are the quantities used for my Anise strawberry and pistachio tart. The quantities and proportions can vary for other recipes. Heat the milk, star anise, cinammon stick or vanilla pod in a heavy-based saucepan till just simmering. Remove from heat. Cover and allow to infuse for around an hour for a more pronounced flavour (you might want to take out the star anise or cinammon stick immediately if the flavour’s already strong). After 1 hour or so warm again. 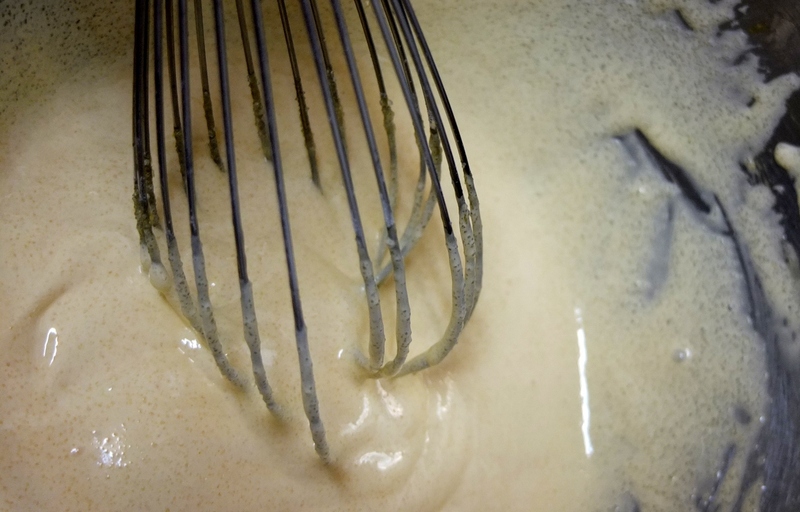 In a large bowl, whisk the egg yolks till pale and fluffier. Add the xylitol and whisk till well combined, then add the cornflour and salt and whisk till combined and fluffy. 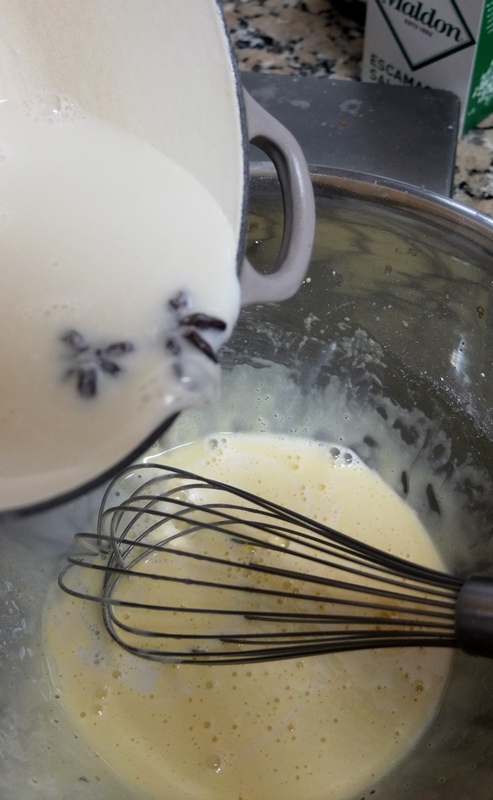 Pour the warm milk slowly into the bowl while whisking. 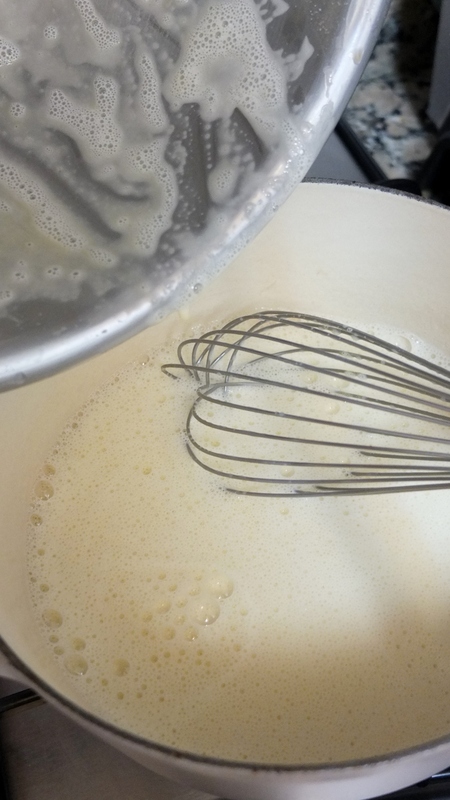 Pour all the mixture back into the saucepan and whisk constantly on a low to medium heat until it thickens. Too liquid and it’ll be a loose cream on the run, too thick and it’s a tad gungy. Try to get it to a nice creamy consistency that is shiny and holds but not gooey. Whisk in any extra flavouring or paste till well combined. Pass through a sieve into a small-medium glass or metal bowl. Cover with plastic wrap/cling film on contact with the cream. Store in the fridge and chill a few hours till needed or use the next day. I’ve used this cream to make a variety of desserts including my healthier Swedish princess cakes and Fraisier (strawberry cake). It’s lovely. light and tastes delicious! Here it is in a kiwi tart – some greek yoghurt was warmed and combined with some gelatine then folded into the pastry cream to lighten it even more.